In the 1930s, Paul Sperry, a former Navy Sailor, avid outdoorsman, and designer of duck decoys, bought himself an old schooner that he fixed up and made seaworthy. While he loved to sail it around Long Island Sound, he found to his dismay that the boat’s painted decks were royally slippery when wet. After one particularly bracing fall overboard, Sperry vowed to find a way to get better traction. So Sperry went back to the drawing board, this time deciding to alter the other side of the contact surface equation: the shoes he wore on deck. Rubber-soled shoes seemed to be one key in providing a little more stick, but after making hundreds of experiments with them, none truly provided the grip Sperry desired. Then one day Sperry noticed the way his dog Prince was able to agilely run over icy ground, and a light bulb went off. He examined the pooch’s paws and noted that the cracks and grooves on their pads provided a natural non-slip surface. A drawing of the siped sole from Sperry’s original patent application. Sperry set out to build a similar functionality into a pair of shoes, using his penknife to carve a herringbone pattern of sipes (slits) into a set of rubber soles. The textured grip they provided proved highly effective in keeping him steady on his schooner. Sperry also made the soles white, as to not leave any marks on the deck. The “Sperry Top-Sider” debuted in 1935 with a canvas upper, which was changed two years later to a specially tanned leather. The shoe quickly took off amongst the sailors and skippers around New England and beyond. In 1939, the US Navy contracted with Sperry to supply the Top-Sider to its Sailors and it became part of the official casual uniform at the Naval Academy. Over the course of the 20th century, what came to be known as the deck shoe or boat shoe gained manufacturers other than the Sperry company and fans far outside nautical circles, becoming indelibly associated with a general East Coast preppy look. Today, there are those who continue to avoid the boat shoe for that exact association, or because they don’t think a boat shoe ought to be worn on land. But this classic footwear deserves a place as a men’s wardrobe staple. Today we’ll explain why, as well as how to wear them with both comfort and style. Why Wear a Boat Shoe? There aren’t a lot of casual summertime footwear choices for men. Especially if you’d like to get extra lightweight and skip the socks. And especially if you’re wearing shorts. You can go sneakers, which are fine, but can’t rise above the very casual. There are flip-flops, which don’t look great and read as adolescent. And, there’s the boat shoe. These slip-ons are as easy to wear as sneakers or sandals, but look a little sharper and can be paired with slightly dressier clothes. Plus, they’re fairly cool and (at least once they’re broken in) quite comfortable. The boat shoe both looks good and remains functional — you can wear them into water, and even if you won’t find yourself cruising on a yacht anytime soon, they provide good traction on any kind of slippery surface. These advantages aside, the deck shoe still has its critics. There are those who say the boat shoe only belongs on a boat. But if a man were to strip his wardrobe of all the clothing and accessories that he didn’t wear in correspondence with their original function, he’d have to remove khakis (originally created for soldiers’ uniforms), the wristwatch (originally created to synchronize military attacks), the pea coat (originally created for sailors), jeans and work boots (originally created for blue collar workers) . . . indeed, so many articles of clothing were first created for another purpose before they ended up as everyday wear, that this man would have to go around almost naked. Just because something began its life to fulfill a particular function, doesn’t mean it can’t now be worn for its aesthetics. Then there are those who say the boat shoe has too preppy an association. It’s true that this footwear has been worn by many a real, and wannabe, blue blood, as well as legions of fraternity brothers. But the shoe doesn’t have to read as overly preppy; it’s all about how you style it; as we’ll get into below, its overall impression is a matter of what you choose to wear with it. With those two criticisms hopefully put aside, and a case for the boat shoe made, let’s move on to what defines this footwear, and how to wear it. Boat shoes are moccasin-like footwear that are distinguished by their low cut, handsewn construction, soft, white, non-skid, non-marking, siped rubber sole, and laces that run not only through 2-3 eyelets (2 being the most traditional) on top of the shoes, but in and out of their sides as well; this 360-degree configuration allows you to cinch the laces all around the shoe for a tighter fit. While boat shoes are made with both canvas and leather, the latter (which has been treated to repel water) is by far the most traditional and quintessential material, and the laces are typically made from leather (usually rawhide) as well. These laces, at least once cinched and tied, are largely decorative — the shoe functions as slip-on footwear. Material. Pick a deck shoe in leather — it’s both more durable and snazzier than canvas varieties, and can be paired with slightly dressier clothes for a sharper look. Shoes made with Horween Chromexcel (a specific type of leather from the Horween tannery) will be a little softer from the get-go and break in a little faster than other leathers, because of the amount of greases and oils it’s made with. Color. Boat shoes come in a wide variety of colors these days, but it’s best to go with a darker brown. It’s the most handsome, classic, and versatile color and will go with nearly everything. Navy is a runner-up in the versatility department; it looks great with burgundy and gray bottoms, and decent with ones which are khaki-colored, though it doesn’t look so hot with denim. Most boat shoes have an elevated heel, but if you’re a fan of more minimalist footwear, check out the boat shoes from Lems which have zero-drop outsoles that are so flexible you can completely roll them up (and stuff them in a bag, if need be). Fit. Boat shoes take a while to break in (see below), so don’t expect them to feel like a dream right out the box. That being said, fit is quite important in a shoe you’ll likely be wearing without socks, and there are issues that breaking in won’t fix. Boat shoes shouldn’t fit too differently from normal shoes, but you want to go for a little snugger fit than you usually would because they will stretch out and get looser as you wear them; you’ll often need to go a half size down from your normal size, and if you’re between sizes, go with the smaller of the two. The snugness is especially important if you plan on wearing the shoes sockless. Make sure the heel doesn’t move around too much, as this is a typical hot spot for boat shoe-induced blisters. Walk around quite a bit when you’re trying on the shoe to make sure there aren’t any spots that seem to gap open, or greatly pinch or chafe your feet (again, a little chafing is normal). Brand/Price. Sperry still sells the “Authentic Original” that harkens to the design of the very first model, but these are now imported and get mixed reviews, with some longtime customers reporting that they have declined in quality, comfort, durability, and water resistance. Sebago’s Docksides are another well-known, imported boat shoe that’s about on par in price with Sperry, but which some feel is slightly better in quality. Eastland, Quoddy, and Rancourt make handsome, top quality boat shoes that are handsewn in Maine, but you’ll pay a high premium for domestic craftsmanship. Personally, while I typically believe in paying top dollar for something that will last forever, I actually prefer my boat shoes to be more disposable (I wear the Sperry A.O.). When you’re wearing something made with a thinner leather, without socks, in hot weather, they invariably wear down fairly quickly, and can also become pretty stinky (though there are ways to mitigate this; see below). Boat shoes can’t be re-soled after they start to deteriorate, and while they can be cleaned, it’s hard to get all the stink out. So I wear them more like a “beater” shoe, and actually don’t want or expect them to last more than a few years; I’d thus recommend buying a pair at a price point that reflects this disposability. Leather boat shoes range from $50 on the low end to $325 on the high end; I think something around the $100 mark represents a good intersection of modest durability and good looks/quality. Shoes from brands like Sebago and Sperry can have wildly different prices on Amazon and other sites, so be sure to shop around for the best deal. As just mentioned, boat shoes take some breaking in — and this process can take anywhere from a week to a month, depending on how much you wear them. But the short-term pain is a long-term gain, as they’ll eventually conform right to your foot and become very comfortable. When you take the shoes out of the box, feel around them with your fingers for any hard spots in the leather and massage them out. Feel inside the shoe as well, for any pointy thread ends that could prove an irritant and need to be snipped off. Start wearing the shoes slowly at first — just around the house for a bit, and then on short errands. If they create a hot spot or blister, cover it over with moleskin or a Band-Aid, and keep on wearing them. To accelerate the breaking in process, some recommend soaking the shoes in water and getting them completely wet. Sop up the excess water with a towel (realizing the color of the leather may come off on it), and then put the wet shoes on your feet and wear them until they’re dry (don’t try to artificially dry them with something like a hair dryer). Saturating the leather with water allows its fibers to stretch and then shrink to the shape of your foot. I haven’t tried this personally, and thus can’t vouch for its efficacy or safety. Boat shoes can be a clutch part of your casual summertime wardrobe, taking you to pool parties, picnics, BBQs, dates, outdoor restaurants, beachside get-togethers, errands about-town, rooftop bars, and strolls along the boardwalk. Mind the following dos and don’ts and wherever you go in them, you’ll do it in style. Wear in warmer weather. 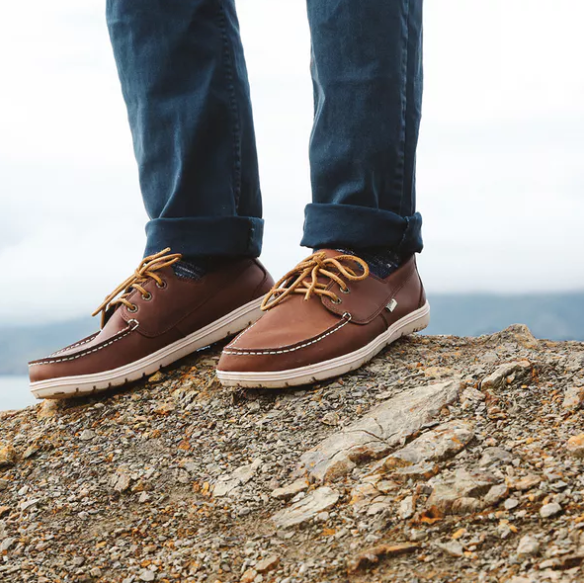 The boat shoe’s low cut and softer, thinner leather — as well as its seafaring heritage — make this footwear only appropriate for pairing with lightweight pants and shorts and for wearing in the summer and climates that stay warm year-round. The fact that the shoe leaves much of the foot exposed, won’t stand up well to the snow and ice, and doesn’t pair well with pants in thicker fabrics, conversely makes it inappropriate for wearing in the winter and colder climes. Wear with your nicer casual clothes. 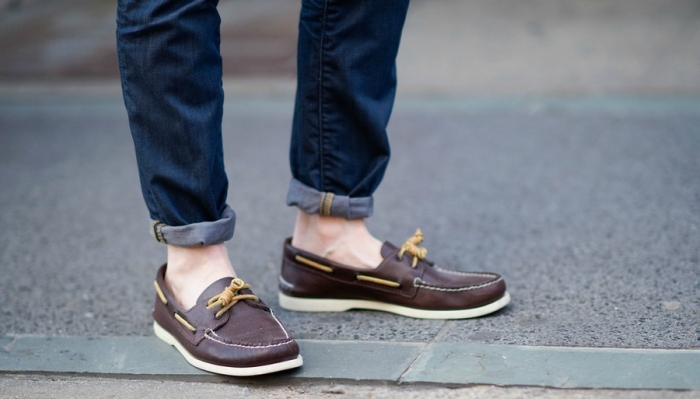 The boat shoe is casual footwear; as mentioned above, they’re an easy swap for sneakers. But boat shoes up the class level just a notch, so that they look best not with an ordinary t-shirt + jeans/shorts combo, but with a polo shirt, button-down shirt, short-sleeve henley, or guayabera on top, and nicer jeans, khakis, or shorts on the bottom. You can even wear them with a blazer — if you dress down the rest of the elements in your get-up. But once the occasion calls for a tie, you know the boat shoe isn’t the right footwear choice. It isn’t suited for an event that rises above the “smart casual” category. Wear with the right style bottoms. 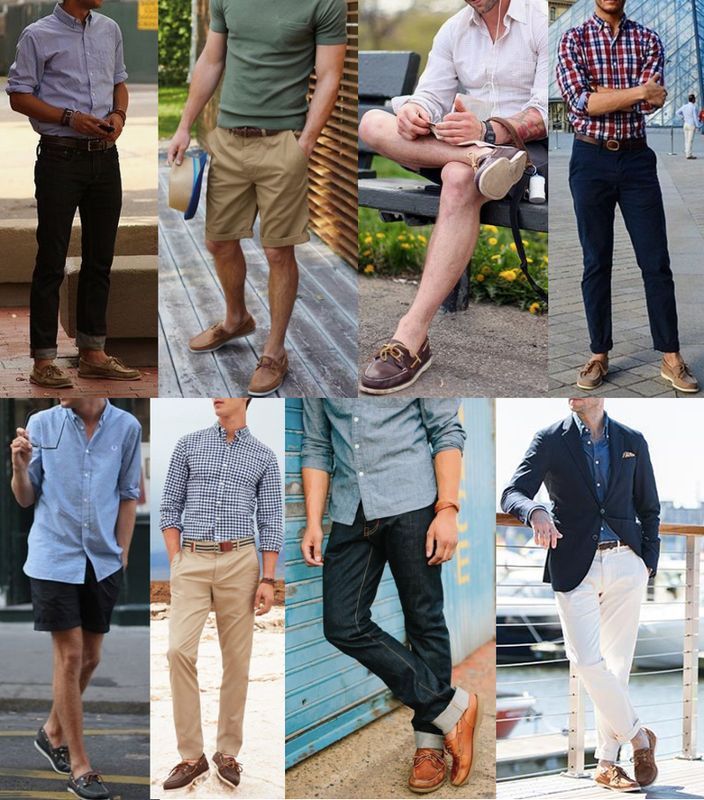 Boat shoes pair best with more tailored (non-cargo) shorts or well-fitted, tapered or straight leg jeans or khakis. Too wide a pant looks funny with little moccasin toes sticking out the bottom. The color of your moccasins should contrast with that of your pants; they should be darker, rather than lighter or the same color as them. This is less important when it comes to navy pants and blue jeans, but light beige boat shoes and light beige chinos are not a good combination. Your pants should break a little higher than normal, ideally just skimming the tops of your shoes; you want to show their distinctive detailing, rather than having them look like a pair of non-descript moccasins. If your pants are long, you can roll them up a little, but don’t get carried away and have them trend into clam-digger territory. Play with different ways to tie your laces. Rawhide laces can come undone when tied with a normal shoelace knot, so consider playing with different ways to tie them, both for the function of keeping them from coming loose, and because different lacing styles can change the look of the shoe (e.g., the barrel knot gives it a more preppy look). You can find a guide to 5 different tying methods here. Take precautions against shoe stink. When you wear boat shoes regularly, especially without socks, your feet are going to sweat a lot in them. And when your feet sweat a lot in them, they’re going to start to smell. Try to mitigate that stank as much as you can by following the guidelines we offer here. Wear to the office. Boat shoes aren’t a great choice for office wear, even if your office adheres to a “smart casual” dress code. They just exude a leisurely, lounge-y, “after-hours” look that doesn’t say “on the job.” You’d be better off with something still casual but sturdier and more “active,” like a chukka boot or even a nice leather sneaker. It doesn’t seem the no-socks-with-boat-shoes rule has always been iron-clad; if you look at old pictures of men in boat shoes, surprisingly enough, wearing socks (often white ones no less!) with boat shoes seems like it used to be a thing, sported even by the likes of heavyweight boxing champion Ezzard Charles. Wear with socks (probably). Given their sailing, summertime heritage, and the simple fact that any shoe worn with hosiery looks terrible when paired with shorts, boat shoes shouldn’t be worn with socks — at least ones that are visible. For help with sweaty feet, you can still wear the no-show variety, and if even those keep peeping out, try a terry cotton liner instead. Of course, as we already argued, just because something made sense for how a wearable was originally used — like going sockless with boat shoes while sailing — doesn’t mean we have to be beholden to that original model. While it can be hard to shake such a long-standing association and the feeling that socks with boat shoes look altogether wrong, you could wear socks if they were dark (not white), and if you wore pants (not shorts). Hypothetically. But I personally come down on the side of socks never being a good idea. Wear with preppy-reading clothes (unless that’s what you’re going for). 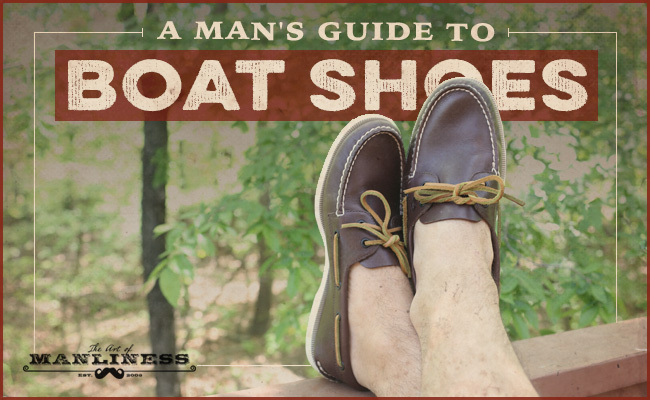 As mentioned at the start, boat shoes have a reputation as being the footwear of frat boys and snooty WASPs. To wear them without evoking this image, mediate the shoe’s associations with the rest of your clothes; that is, don’t wear a nautical-striped t-shirt, a pastel-colored polo shirt (with the collar popped), a blazer on top and shorts on the bottom, or Croakie sunglasses. Or talk with a Mid-Atlantic accent. And you should be fine.